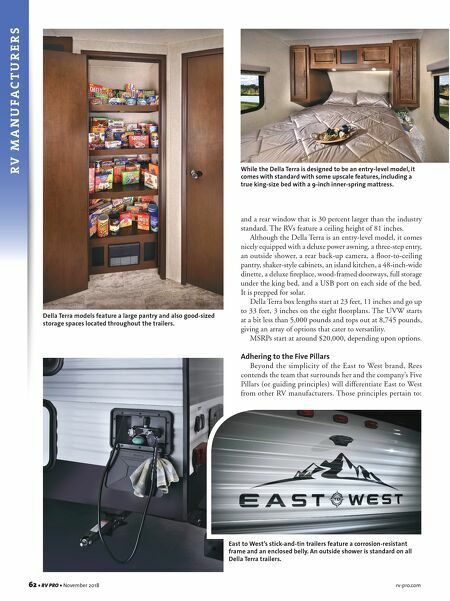 62 • RV PRO • November 2018 rv-pro.com R V M A N U F A C T U R E R S and a rear window that is 30 percent larger than the industry standard. The RVs feature a ceiling height of 81 inches. Although the Della Terra is an entry-level model, it comes nicely equipped with a deluxe power awning, a three-step entry, an outside shower, a rear back-up camera, a floor-to-ceiling pantry, shaker-style cabinets, an island kitchen, a 48-inch-wide dinette, a deluxe fireplace, wood-framed doorways, full storage under the king bed, and a USB port on each side of the bed. It is prepped for solar. Della Terra box lengths start at 23 feet, 11 inches and go up to 33 feet, 3 inches on the eight floorplans. The UVW starts at a bit less than 5,000 pounds and tops out at 8,745 pounds, giving an array of options that cater to versatility. MSRPs start at around $20,000, depending upon options. Adhering to the Five Pillars Beyond the simplicity of the East to West brand, Rees contends the team that surrounds her and the company's Five Pillars (or guiding principles) will differentiate East to West from other RV manufacturers. Those principles pertain to: While the Della Terra is designed to be an entry-level model, it comes with standard with some upscale features, including a true king-size bed with a 9-inch inner-spring mattress. Della Terra models feature a large pantry and also good-sized storage spaces located throughout the trailers. 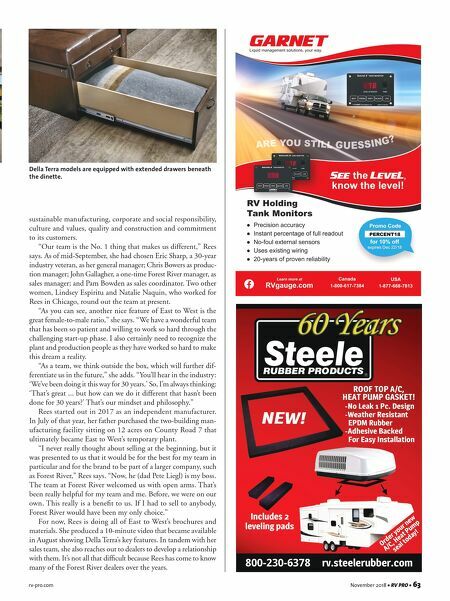 East to West's stick-and-tin trailers feature a corrosion-resistant frame and an enclosed belly. An outside shower is standard on all Della Terra trailers.